75 years ago today, Orson Welles’ radio theater program Mercury Theater On the Air produced a radio drama that shocked a country, changing forever broadcasting as we know it. That program was “War of the Worlds,” an adaptation of H.G. Wells’ novel of the same name, billed as the Halloween episode of the series and presenting like a news report of a martian invasion of New Jersey. The lasting legacy of the program is the effect it had on listeners, especially those listeners in the New Jersey area. Due to “War of the Worlds'” presentation as a legitimate news program, the story goes that the general public erupted into a frenzy, believing that an alien invasion had indeed landed in New Jersey. The broadcast of “War of the Worlds” began with what appeared to be a weather report, followed by a musical program like any other one might hear on the radio during this era. The musical program is interrupted several times by a news bulletin on explosions witnessed in the sky over Chicago, which become increasingly in-depth as the program goes on. Orson Welles plays an astronomy professor who discusses the possibility of a martian invasion, noting disturbances in the planet Mars of late. The program switches back and forth between the broadcast of cheery, popular music and increasingly grave, disturbing, and serious reports–ultimately from a farm town called Grover’s Mill, NJ where a reporter reports on aliens who have landed in that town. For me, the scariest part of the broadcast occurs about 17 minutes in–when the increasingly panicked voice of the reporter, the screams and shouts and sirens in Grover’s Mill suddenly cut off and the program is completely silent. The announcer says that there is a problem with the field transmission, and when it returns, the announcer reports that several deaths have occurred. According to reports, as the program was broadcast, people in the New Jersey area panicked, fainted, ran into the streets, and suffered from hallucinations of the things they had heard about on Welles’ program. 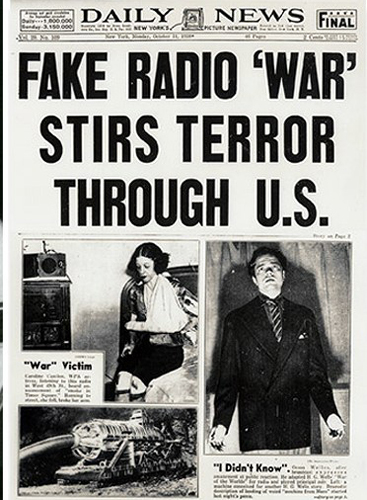 The next day’s Daily News headline screamed “FAKE RADIO ‘WAR’ STIRS TERROR THROUGH U.S.” The New York Times added “Radio Listeners in Panic, Taking War Drama as Fact.” The news media worked itself up into a frenzy, with calls for Welles to make a formal apology to those he had frightened and for Washington to look into what had happened. Welles did make a formal apology, but insisted upon his innocent intentions and bewilderment regarding the public response. Nothing like this had ever been seen or heard before. To audiences in 1938, the radio and the newspaper were the two most trustworthy things in life, and the concept of satire or parody in this context was completely foreign. This was also a particularly worried and aware America–the threat of war in Europe was looming large in 1938 (it would break out 11 months later with Hitler’s invasion of Poland) and broadcast media was relied on and trusted to give completely accurate information to this tense nation and world. Orson Welles, already a bona fide genius who had not yet reached his 24th birthday, was still wet behind the ears. It is unlikely that he fully understood the effect that his symbolic, metaphorical work of drama could have on a world waiting on baited breath on the brink of war. The New York Times headline that illustrates the panic in context with world events, to the right. 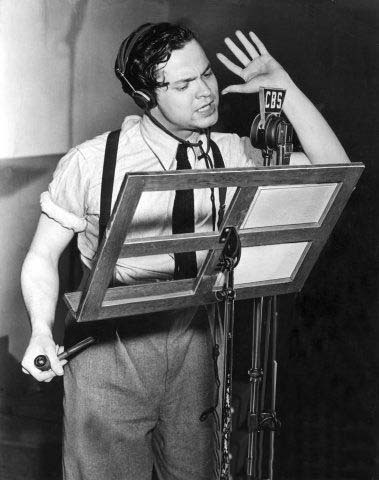 The backlash against Welles and “War of the Worlds” was so great, that it gave rise to serious debate within the Federal Communications Commission about the possibility of radio censorship in order to protect the public interest (a prior FCC regulation reserved the right to revoke the licenses of stations deemed unfit to serve the public’s interest, but never was there an issue of censorship–the FCC had only looked into the holistic practices of a station when determining whether or not to renew their licenses). Ultimately, no direct regulation came out of the “War of the Worlds” hysteria, but the FCC has kept the event in its mind. Several subsequent policy statements from the FCC have made it clear that intentional deception on the air is not something to be tolerated, and have established a bit of a de facto ruling that a station may not broadcast knowingly false information to the general public. Given the infamy of the event and the massive uprising against Welles and the program, it is easy to take our collective memory as truth. There have, however, been several scholarly reports to come out lately about the exact level of hysteria and how it matches up with our memory. One thing that is often overlooked is that “War of the Worlds” was competing opposite one of the most popular radio shows of the time–The Edgar Bergen and Charlie McCarthy Show. According to Broadcasting, only 2% of polled audience members said they were listening to “a radio play” or “The Orson Welles program.” None said they were listening to a “news program,” which would be what those who believed Welles’ program as truth would say. It seems that our perception of “War of the Worlds” may have been skewed by the media–and if so, aren’t we the real victims of a hoax? If the newspapers fabricated the story of the hysteria, it truly was a case of media overreach–but not from the direction they claimed. It seems that these trusted news sources may really have been the ones to blame…not 23-year-old Orson Welles. Here is the complete broadcast of Orson Welles’ “War of the Worlds,” celebrating its 75th anniversary tonight. Thanks for reading, and thanks for tuning in for this countdown to Hitchcock Halloween! Don’t forget to submit your blogathon posts tomorrow, I will be making a post first thing in the morning. This entry was posted in Lara Gabrielle Fowler and tagged 1938, fcc, hysteria, new york times, orson welles, war of the worlds, world war II. Bookmark the permalink.